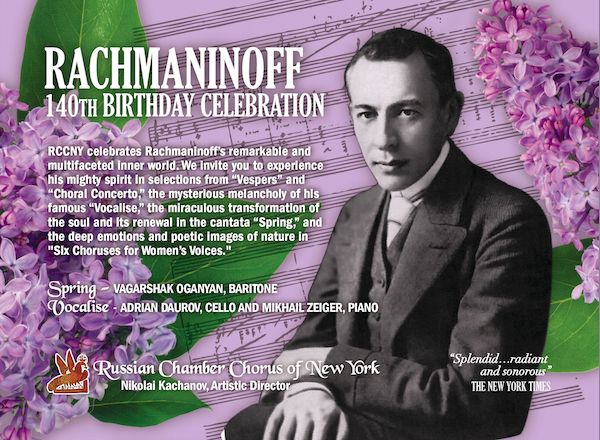 April 2013 is Russian-American History Month in New York State – and by happy coincidence it’s also the 140-year anniversary of the birth of Sergey Vasilyevich Rachmaninoff. The great composer was born on April 1, 1873, in the Novgorod province of Russia, and later took America as his second homeland. Celebrating this anniversary is important for Russia and America, especially for New York City, where he lived and performed. These concerts are supported, in part, by the Fund for Creative Communities, administered by the Lower Manhattan Cultural Council. THE RUSSIAN CHAMBER CHORUS OF NEW YORK (RCCNY) was founded in 1984 by Artistic Director and Conductor Nikolai Kachanov. Over its twenty-eight Year history, the chorus has become America’s preeminent Russian vocal ensemble and a highly admired ambassador of the Russian creative spirit. RCCNY is known for stylistic versatility, richness of sound, subtlety of expression and heartfelt singing. RCCNY’S mission is to build a bridge between the rich Russian choral tradition and today’s American audiences. RCCNY performed in Carnegie Hall in Stars of the Kirov Celebrate Russia Day, in Mahler’s Symphony No. 2 with the Kirov Orchestra under Valery Gergiev, in Prokofiev’s Alexander Nevsky with the St. Petersburg Philharmonic, under the direction of Yuri Temirkanov. Earlier Carnegie Hall appearances include performances with the Czech Philharmonic under Vladimir Ashkenazy, with the Moscow Virtuosi under Vladimir Spivakov, and at the Moscow 850th Anniversary Gala and with the American-Russian Youth Orchestra under Leon Botstein. The chorus also appeared on the nationally acclaimed NPR radio program “A Prairie Home Companion” with Garrison Keillor. Materials about chorus were published in the Moscow magazine “Melodiya” and in the publications at the Moscow State Conservatory.